Go, Tracy, Go! : Seriously? SERIOUSLY? I find the whole thing wrong. Am I alone here? 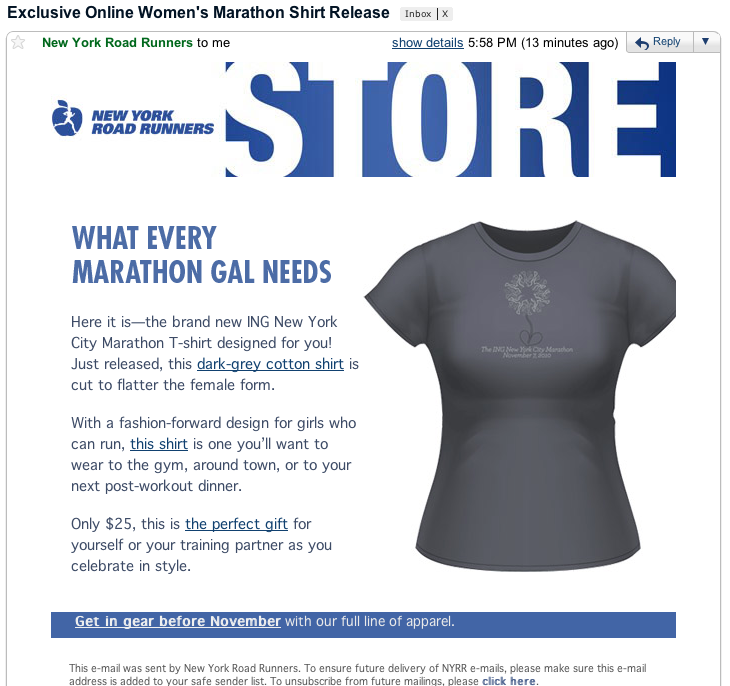 Everything from the flippant "What every marathon gal needs" (what I need: how about, not being talked down to by being called a gal?) to the $25 price tag on a cotton t-shirt to the "fashion-forward design" - flowers and hearts, natch, because that's what we gals like. If only it had been pink... sigh. I'm excited to be running the NYCM. I support the NYRR, even though I've had some complaints about their corral system before. And I get that it's an expensive race to put on and that a lot of people appreciate the chance to buy merchandise to support their training. And of course I get that if I don't like the shirt, I should just not buy it. But... but... I'll save my money for the gloves with the five boroughs on each of the fingers that you can buy at the expo, thank you. Imma rock those flower-free bad boys every day this winter. WOW. Gals like us need to stick together Tracy! I didn't even get the e-mail. And I'm kind of glad, honestly. Maybe "Johanna" doesn't signify me as a gal? Then again, I enjoy it in a kind of gun-moll sort of way, like Bonnie was Clyde's best gal. Maybe I'm just weird. I'm glad I'm not alone here. I mean, on the spectrum of bad marketing, this certainly isn't offensive per se, it's just kind of odd. Jo, maybe you're right and they were shooting for campy. Weird! Annie - WORD! "Hubby" is probably the worst word ever invented. But I digress. I really commented to say that I bought some of those five-boro gloves last year and wore them outside of running, I liked them so much. Soooo much better than hearts and flowers.